True to our word, 11 days after release and the discovery that the printers messed up the Digipacks for a chunk of the Gurren Laganns - we're now ready to replace anyone impacted! We've all the juicy details below on how to do it and a note on how to tell if yours is impacted! HOW DO I TELL IF MY DIGIPACK NEEDS REPLACED? This should be self explanatory but it's best to be safe! 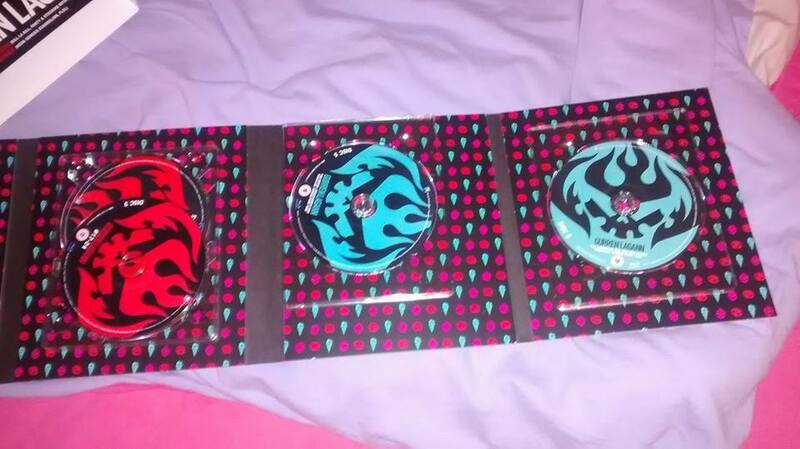 All four trays should be in the same position in the centre of the digipack pages. If by chance your third (or any other disc tray) is not - then the printers had not let it glue long enough and you qualify for a replacement! YEP, MINE'S BUSTED - WHAT NOW? 1. 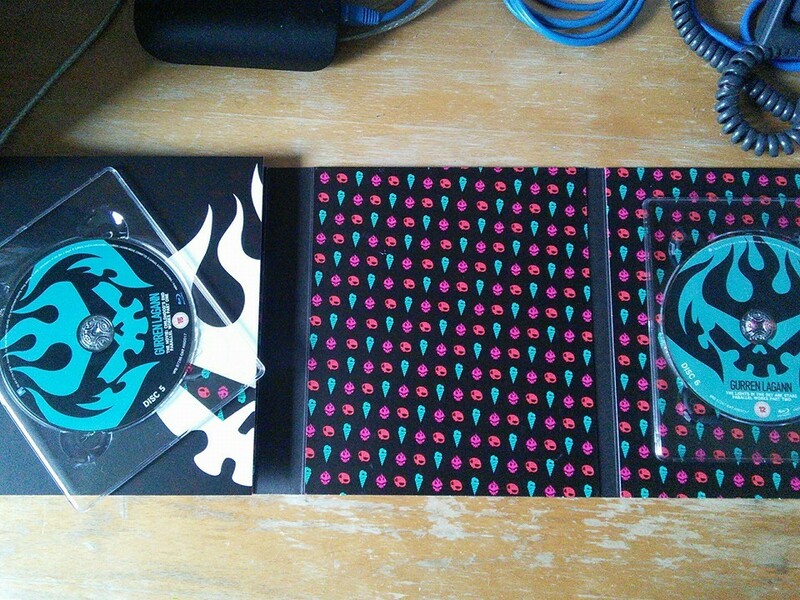 Mail kerry@ alltheanime.com (minus the space) with a quick shot of the digipack (don't worry if glued back already and concerned, we'll understand). If possible too send a proof of purchase - just an Amazon order confirmation or such - don't worry if you can't find your receipt! 3. Wait: First shipment will be 2 weeks from today then every two weeks until end of year, afterwards we'll keep processing on a month by month basis as we'd expect most of those impacted to be covered by the end of the year here. You'll get a confirmation as soon as the digipack is sent out so fear not! Hope this helps folks - as it sure annoyed us that it happened to begin with. So again on behalf of the printers we can only apologise profusely to folks and make this right as quickly as possible :). The more things stay the same! We've had to push the release date back for Kill la Kill on Blu-Ray to December 1st again (1 week before it was originally scheduled to be). This is because an eagle-eyed forum-goer who picked up a copy at MCM Expo spotted a 0.4 second desynchronisation on the dub track on Episode 4 of our Blu-Ray print (DVD isn't impacted, so will remain on date). On further inspection it looks like there was an issue on our end with it so we've gone and done the only thing we think is right - quarantine all stock before it goes out to retail and replace Disc 1 with a corrected CMF so folks looking for the dub get a fix without need for a replacement scheme. Basically it means all retail stock will be fixed now at our own expense (which believe me, is not cheap). Hopefully it reaffirms to fans our commitment to get good product to you though! 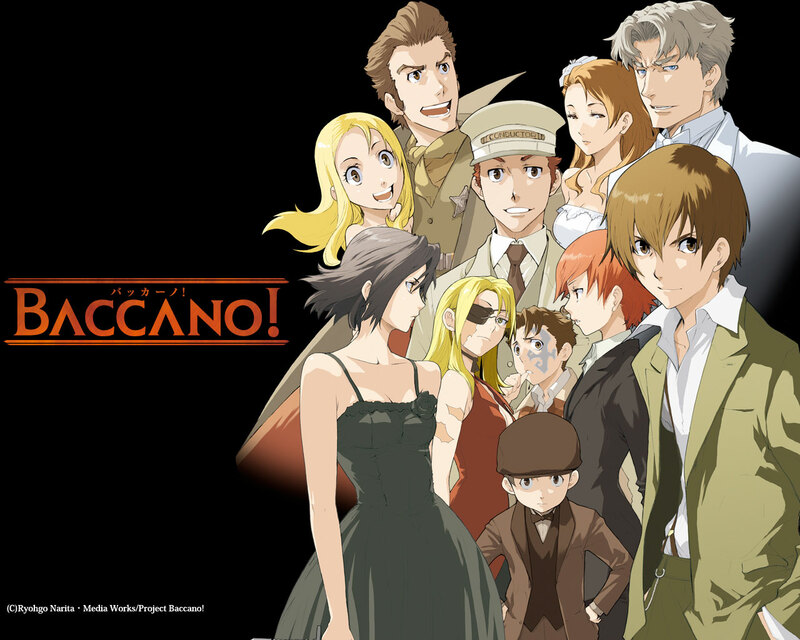 Glasgow, UK 26 Ocotober, 2014 - Anime Limited, the Glasgow-based anime licensing company and parent company of All the Anime, are pleased to announce the release of the classic Takahiro Omori series Baccano! on blu-ray for the UK. Hot off the "Roaring Twenties" and headfirst into the uncertain volatility of the "Dirty Thirties," criminal syndicates stormed into power by bootlegging alcohol during the Prohibition Era - but the most notorious "liquor" of all time is about to set off a violent chain reaction within the mafia underworld! Each story involves several unrelated plots intersecting and crossing each other as events spiral further and further out of control. Immortal alchemists, mafia-operated speakeasies, and many other elements of pulp fiction are mashed together for a world straight out of the movies. Anime Limited will release the complete series on blu-ray only. The plan is to release this classic as an Ultimate Edition depending on on what materials are made available. Details on the release and dates are yet to be confirmed. President of Anime Limited, Andrew Partridge says: "I'm beyond ecstatic to release Baccano! on blu-ray! I've been trying to release this since it first came out when I was at Beez but, alas, lost out to Funimation. I am super psyched to be releasing this and will push for as much as I can get to make an Ultimate Edition. Watch this space!" Glasgow, UK October 24, 2014 - Anime Limited, the Glasgow-based anime licensing company and parent company of All the Anime, are pleased to announce the release of the Oscar nominated collection of animated shorts Short Peace for the UK. In 1995, Katsuhiro Otomo's anthology Memories showcased the work of upcoming superstars of the anime world. 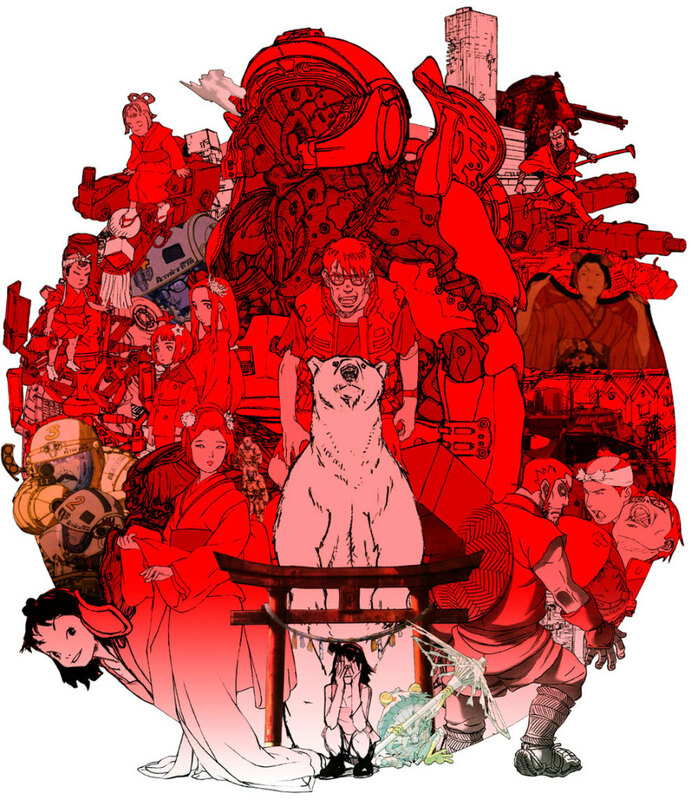 Now, Otomo's spotlight shifts to a fresh generation of master creators with an all-new anthology of visionary films. A lone traveler is confronted by unusual spirits in an abandoned shrine in the 2013 Academy Award nominated Possessions (Tsukumo), directed by Shuhei Morita (Coicent, Kakurenbo). A mysterious white bear defends the royal family from the predations of a red demon in the brutal Gambo, directed by Hiroaki Ando (Five Numbers!) from Redline's Katsuhito Ishii's original story with character designs by Yoshiyuki Sadamoto (Neon Genesis Evangelion). The focus shifts from supernatural to science fiction for the action-packed A Farewell To Weapons (Buki Yo Saraba), as Mobile Suit Gundam designer Hajime Katoki helms Otomo's tour-de-force saga of men battling robotic tanks in apocalyptic Tokyo, while grandmaster Otomo himself assumes the directorial reigns for a spectacular tale of love, honor and firefighting in ancient Japan with the multi-award winning Combustible (Hi-No-Youjin). Short Peace will be released in the UK on home video (blu-ray and DVD), Video on Demand and will also enjoy a limited theatrical run. Andrew Partridge, President of Anime Limited says: "We are very excited to distribute this fantastic piece of work in the UK. It is a great collection of works from the good and great of established talent in Japan. A unique and wonderful collection of works, we're thrilled to bring this award winning collection to the UK complete with an English dub'. Details on release dates to come. Glasgow, UK 25 October, 2014 - Anime Limited, the Glasgow-based anime licensing company and parent company of All the Anime, are pleased to announce the release of the Gankutsuou (The Count of Monte Cristo) for the UK. Albert is a young man of privilege in Paris, but the trappings of his aristocratic birth leave him bored and unsatisfied. Seeking adventure, Albert's restless spirit leads him to a festival on the moon - and to the Count of Monte Cristo. An enigmatic man of charm and wealth, the Count of Monte Cristo's charisma and sophistication captivate Albert. The fascinated youth invites the nobleman to mingle within the upper echelons of Parisian society, and the Count is soon courting the favor of France's most powerful families. Little does Albert know, as his new friend walks the ornate halls of the highest class, the Count of Monte Cristo wants only to bring them crashing down through vengeance. Gankutsuou will be released in the UK on home video - blu-ray and DVD - and on video on demand by Anime Limited. Andrew Partridge, president of Anime Limited says: "It's great to be able to release this classic series - based on a classic piece of literature- here in the UK and on blu-ray too! I really enjoyed this series when it was first out and I'm glad to bring it back to the front of people's minds. What can I say? We were due a classic release anyway!" 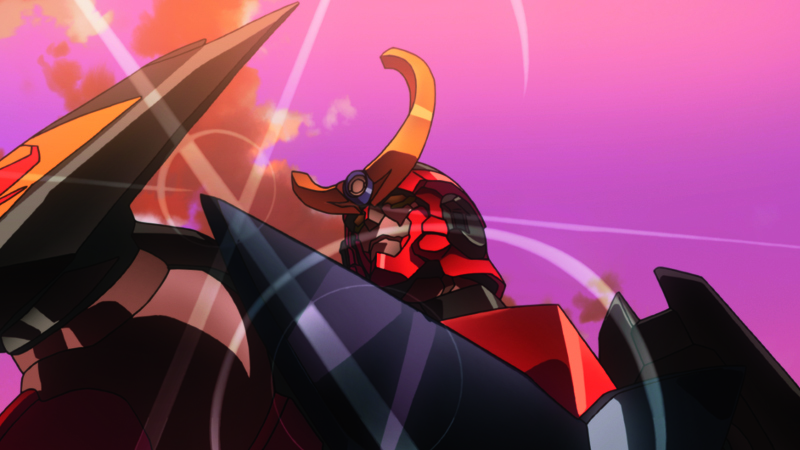 Gankutsuou's release date is yet to be confirmed in 2015.